Page to Stage & Geet Theatre present “Shakespeare Festival” on 29-30 March to celebrate World Theatre Day, at Natarani Amphitheatre, Ahmedabad. Page to Stage will stage “Macbeth”- a powerful, modern interpretation of the classic, set on a University campus, with student union politics as the backdrop. A hard-hitting, edge-of-the-seat political thriller, showcasing the Bard’s relevance today. This English-Hindi bi-lingual play is of 90 minutes duration. Geet Theatre will stage “Raavto”- a gritty, modern interpretation of the classic Othello, set in Kathiawadi Gujarat, with family squabbles and power struggle as the backdrop. A fascinating, authentic narrative, showcasing the themes of the Bard’s words in today’s times. 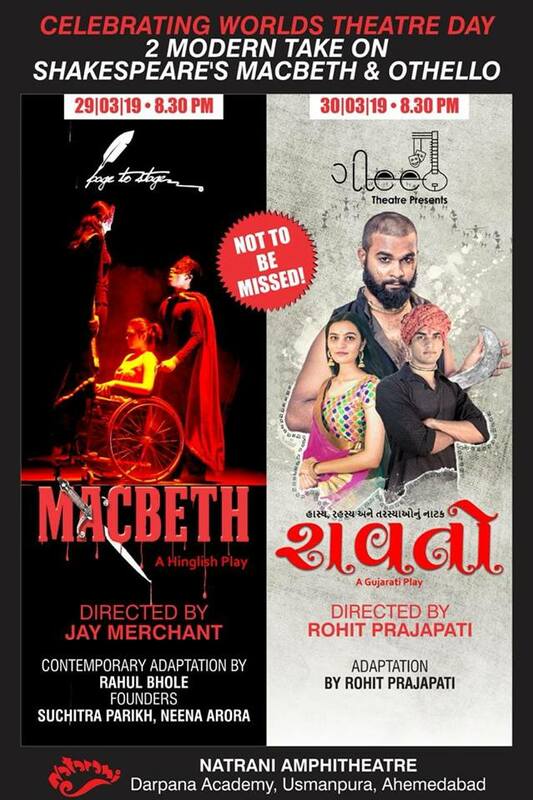 This Gujarati play is of 90 minutes duration.